After looking at some of the reports that we have running here at HubPages, I noticed that we are getting really, really close to officially publishing our 200,000th Hub. This is an amazing achievement, considering that these are strictly the Hubs that have been published and actually stick around after making it through our super-duper spam fighting forces. This 200,000th Hub will be published most likely sometime today and I’ll keep an eye on the tally and let you know which Hubber ends up publishing it. The first Hub is called My Treo 650 On Cingular and it was written by one of our founders Paul Edmondson. The Hub basically if full of information regarding what Paul thought were the pros and cons of his cell phone at the time. 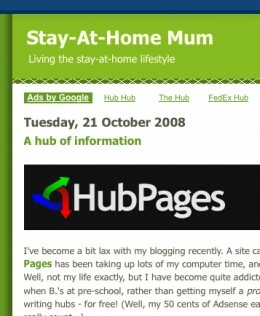 It was published on June 28th, 2006 and on that particular day HubPages had 100 visitors come to the site. Even to this day there are still plenty of Treo reviews being published like this one that reviews the various models of the Treo that are currently available to buy. 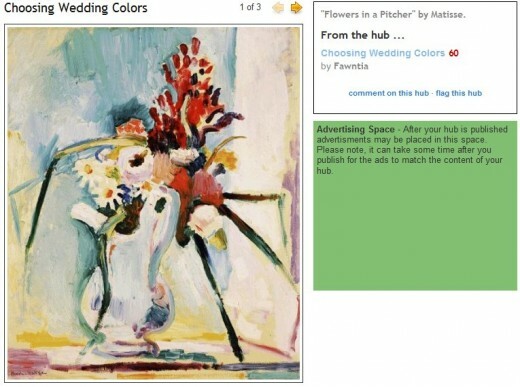 The 100,000th Hub is called Active Versus Passive Devices and was published 20 months later after the first one on April 23rd, 2008. On the day that this 100,000th Hub was published HubPages had 220,000 visitors stop by the site for some sweet Hub-reading action. The 200,000 Hub is only a few Hubs away(199,976 published as I’m writing this), meaning that our amount of Hubs published has gone from 100,000 to 200,000 in 7 months, which is about 1/3 of the time that it took us to go from 1-100,000. Also, on average, nearly 370,000 visitors currently come on over to visit HubPages per day, which is quite a jump as well. 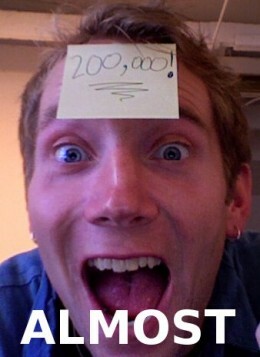 Who will publish the 200,000th Hub? Maybe it will be me? Or, maybe even you? How long will it take to to make it to 300,000 Hubs? I’m guessing that we’ll make it there around 3 months from now, what do you think? UPDATE:The 200,000th Hub published was Baby Safety – Traveling Safely with Your Child. How much do your favorite web sites pay you for your participation? Each of us routinely surfs the web without ever thinking about the fact that most of the places we visit, won’t pay us for going there. When we post a question or answer on a forum, when we propose a solution on Yahoo! Answers, when we edit an article on Wikipedia, or when we submit our evaluation of an Amazon product, we don’t really give much thought to compensation for our participation. After all, when I am looking for an answer to a question, or perusing a biography on Wikipedia or reading through the reviews on Amazon before making a purchase, I’m taking for free the information provided by others. It makes sense that I do my part in giving content back. Indeed, I find it pleasant to think that some edit I submitted to Wikipedia might survive an endless round of revisions or that anyone can go to Amazon to check out my recommended books on ListMania. But the times are a changing. The age of revenue sharing web sites is upon us. It’s great to do stuff for free but why not also get paid? We’ve seen web site after web site rise up, attract energetic folks who foster a community, and for whatever reason, no plan is in place to share revenue with these early participants who helped to build up the site. My prediction: that’s won’t work anymore. Why go to a web site that doesn’t pay you anything when you can have the same experience at a site that shares some of its revenue. And for that matter, if you run a popular community web site, why not offer a little back to your registered users? Especially to those responsible for driving traffic, content, and thereby revenue to your site? Now, since I work at HubPages, I’m biased. For me, Hubpages offers one of the best revenue sharing options around. The opportunity here is pretty straight forward: after you sign up for an account on our site, you can then register your Google AdSense, Amazon, eBay, and Kontera accounts to start earning money. If you don’t have these accounts, there’s help available on setting them up. Then, with each hub you write, you get a share of the revenue that your hub brings in. How much do you get? At HubPages, we give you 60% of the impression revenue. The details are here. You can also add Amazon and eBay affiliate links to a hub using our easy-to-use web-based tools. The idea here is that people shouldn’t have to be technical to get the benefits of revenue sharing. If you can use a browser and e-mail, then you have enough knowledge to participate in these programs. Because it is a hub and not a blog, you can write a hub on any topic without worrying if it relates to anything you’ve written previously or anything that you plan to write in the future. Write just one hub or write hundreds of hubs. It’s up to you. Once you have a registered account, every forum post, comment, and request you make adds an additional link to your personal profile page. This means that each time you participate on the site, you potentially add new web traffic to your profile page which can add up to revenue. See here for the list of discussion forums at HubPages. Now, all these tags, forum posts, comments, and requests will only add traffic if they are relevant and add value to the HubPages community as a whole. For this reason, HubPages has policies which are designed to prevent people from creating links without creating content. You can tell how you are doing by checking your Hub Score. These policies at HubPages have been working well. I think that spam is low and relevant content is high compared to similar revenue sharing sites. HubPages is currently one of the top 250 most visited sites on the web according to Quantcast and rising quickly. So, how much money will you make on a revenue sharing site? At first, you probably won’t make very much and this is fine. It takes time to build up a reputation and to attract large amounts of traffic that start bringing in revenue. If the money comes, great, but that shouldn’t be your focus. The idea is not that you should be paid to participate but rather that if you happen to contribute high traffic content, you should get a share. In my view, “sharing” is the most important part of Revenue Sharing. As anyone who’s blogged or worked with Google Adsense can tell you, small traffic brings a very small return and large traffic depends on whether its the right kind of traffic. Like the credit cards that return 1% of your spending back, you can get a return on your content creation on the web. 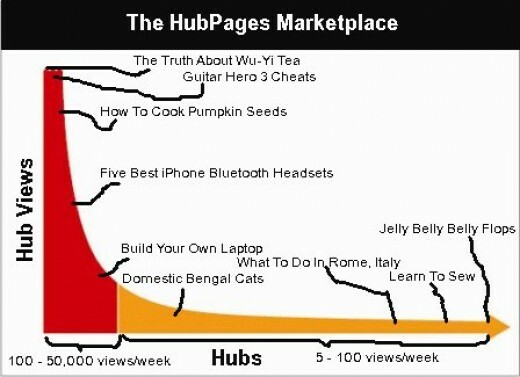 It’s early but the rise of HubPages and other revenue sharing sites show that the web community model is a changing. 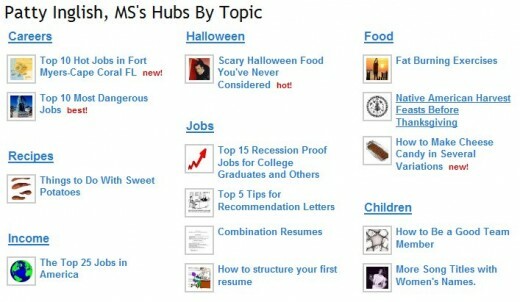 Each day there are tons of different topics that come through HubPages from our awesome community of Hubbers. But, when I saw a Hubber named rethansmith(aka Ethan) for some reason he seemed to stick out a little bit more than most. You see, at the ripe-old age of 19, Ethan is one of our younger Hubbers and he’s currently a sophomore in college where he’s majoring in Business Administration. Seeing as college students are being hit with larger and larger tuition fees with each new school year, there is a growing demand for ways for these students, as well as their parents, can make some additional money and manage the debt that 4 years of college brings along with it. Ethan noticed this trend quickly and decided to do something about it by sharing all of his knowledge and experience on HubPages. Ethan has been really nailing this college niche and with just 9 Hubs written has already seen some great success with these types of topics. Whether he’s writing about 10 Ways To Control College Debt or different jobs available for college students, Ethan is using his first-hand knowledge and experiences to help educate others on all kinds of topics that are important to others that are in his same situation. Also, HubPages isn’t the only place that Ethan writes. 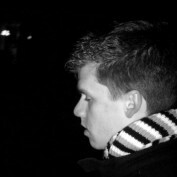 He manages a blog that he created around these college-related topics as well called mycollegedebt.org and he even gave HubPages a great shout-out with his latest post where he explains in detail the 3 ways that HubPages has been extremely valuable to him. Without spoiling everything, his 3 ways are Promotion and Marketing, Making Money and Interaction and Content. Honestly, I don’t think that I could have said it any better myself, Ethan. A couple of days ago we were given a quick mention in the New York Times Bits blog that focuses on tech and Internet news. 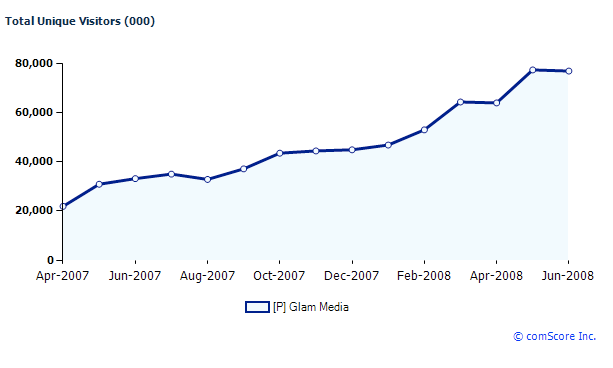 We were brought up due to the fact that we’re one of Glam Media’s larger publisher’s, who the post was focusing on. We’ve been running ads from the Glam network for a few weeks now and from the look of it, so are a lot of other people, too. This might sound kind of sad, but the first thing that I do each morning when I wake up bright and early at 6:15am is check my email on my BlackBerry. Yeah, it’s slightly overboard, but my BlackBerry is right there next to me and since it doubles as my alarm and I have to look at it anyways, it would practically be a waste not to check my email while I was at it. At least that’s what I keep telling myself. Anyways, as I half-opened one eye and looked into the shockingly bright screen this morning I noticed that I had a few emails from a few of the Google Alerts that I had set up for HubPages. Google Alerts are emails that get sent to you based upon Google search terms that you would like to know about as they happen. It’s basically the best way to keep up with that the Web is saying about any topic at any moment in real time. Pretty cool. This site allows you to write about all the things that interest you, and because you’re part of the Hubber community, you automatically have an audience for your work. You can become ‘fans’ of other Hubbers, who can also become your fans, and get notified when you’ve published something new. As well as writing to my heart’s content, I also love reading other peoples’ work. Also, I must say that it was pretty cool to have my History of Mullets Hub listed in her all-time favorite Hubs list. I don’t care who you are, it’s always a good feeling to get recognized for your work. When I describe HubPages to someone who has never heard of us before, I usually end up talking about how easy it allows them to write and be published, how they can write about anything that they’re passionate about and how HubPages sort of like the iTunes of online self-publishing platforms. I say this because iTunes is a great example of the Long Tail effect that HubPages creates for searchable, topical, self-published content – only, of course, iTunes does it for music. Now, although this may be something new to you, the Long Tail is something that has been talked about, written about and discussed within the business and marketing community for quite a while now. But, as more and more people understand it and implement it, the Long Tail is put into practice and becomes more mainstream every single day. Basically what has happened here the last few years is that the Web has allowed us to do business is a different way than before, especially when you’re talking about a purely digital business, such as iTunes and HubPages. The old way of doing business was to offer up content that had a very massive appeal and to sell tons on it to a lot of people. In music, this was like Wal-Mart stuffing it’s shelves with Madonna and Justin Timberlake because they had the biggest opportunity to sell lots and lots of CDs. In this model, there was no room for the little guy who had no chance of selling millions of CDs because shelf space was very limited to the top sellers. Not to mention that these smaller artists usually had no major label support much less a huge marketing budget that would potentially help them get their foot in the door with the 800lb. gorilla known as Wal-Mart. So, even if Your Roomate’s Band sells only 10 songs on iTunes this week, they still have a place to sell them and iTunes has given them the platform to allow them to do it. 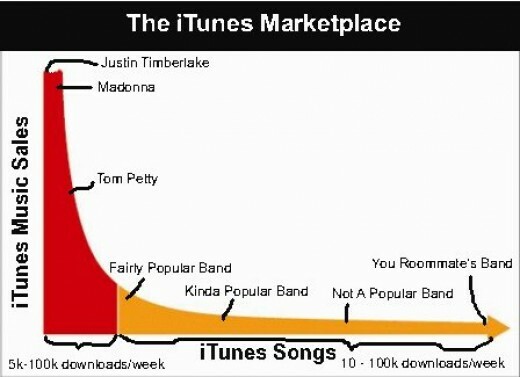 So, on other words, now not only can Justin Timberlake sell one of his songs 1 million times in a week, but iTunes has now made it so that 1 million bands the size of your roomate’s can now sell one song per week as well. 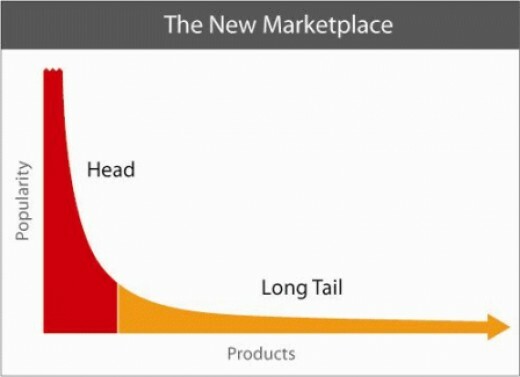 This, my friends, is the Long Tail. Now switching gears over to HubPages, much of the same is true. It used to be that only certain people could get paid for writing due to the limitations of magazine and other news space, proper credentials and the time/topic limitations that many publications tend to strictly enforce. but, just as iTunes has become known as the platform that has enabled a Long Tail distribution model for music, HubPages is now quickly becoming the platform for enabling the Long Tail distribution model to be utilized for writing topical and consumer-expertise content. So, instead of songs being sold, like on iTunes, the HubPages model is Hubs being viewed through search engines such as Google and Yahoo!. These views then turn into revenue being generated for the author of the Hub and depending on the amount of views, the revenue could be pretty significant. For instance, Larry talked about one Hub in particular that gets viewed thousands of times per week and in turn makes over over $100/day, which I would say is some serious cash. I guess that this Hub could be considered the Justin Timberlake of Hubs, but just like with the iTunes model, there is plenty of room for content that gets all different ranges of views per week. For instance, my Jelly Belly Belly Flops Hub gets about 50 views/week, which doesn’t seem like a lot, but if I had about 30 more Hubs with the same type of traffic, I would be pulling in some serious revenue pretty quickly. Now, think about if 10,000 other Hubbers have also written Hubs that get traffic similar to my Jelly Belly Belly Flops Hub – you are now really talking about some major views, as well as some major revenue and it’s all possible thanks to the HubPages platform. So, just as iTunes has enabled music artists of all sizes, HubPages is now enabling content creators of all sizes. If you have something that you’d like to write about, feel free to join up and start Hubbing now and if you have any questions, please leave a comment and I’ll get back to you as soon as I can. Thanks for listening to my random thoughts and come on back soon, I’m sure there will be plenty more where this came from. The biggest problem with the old editor was that the tabs were confusing. 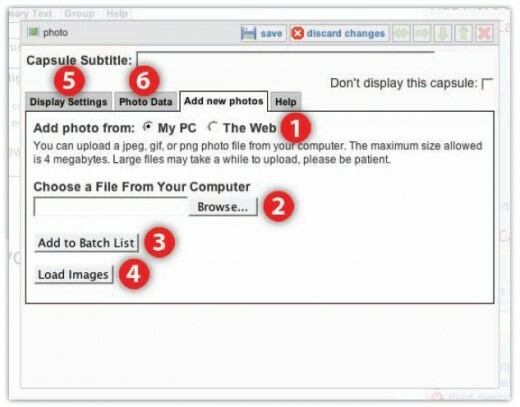 There was one tab to upload photos from your computer or the web. After a photo was uploaded, it appeared at the bottom of the editor as a thumbnail. To add a caption to a photo or change its size, you had to select the appropriate thumbnail and then navigate to the “Photo Data” tab. To change how the images were displayed (for example, to add borders or create a slideshow), you had to go to yet another tab, the “Display Settings” tab. Now you can do all of the things that you could with the old editor, but everything is in one place. You can see the sizes and captions of all your photos in one glance. And best of all: No tabs! I began the original work on this project, but Paul Deeds finished it up and made it look a great deal better. 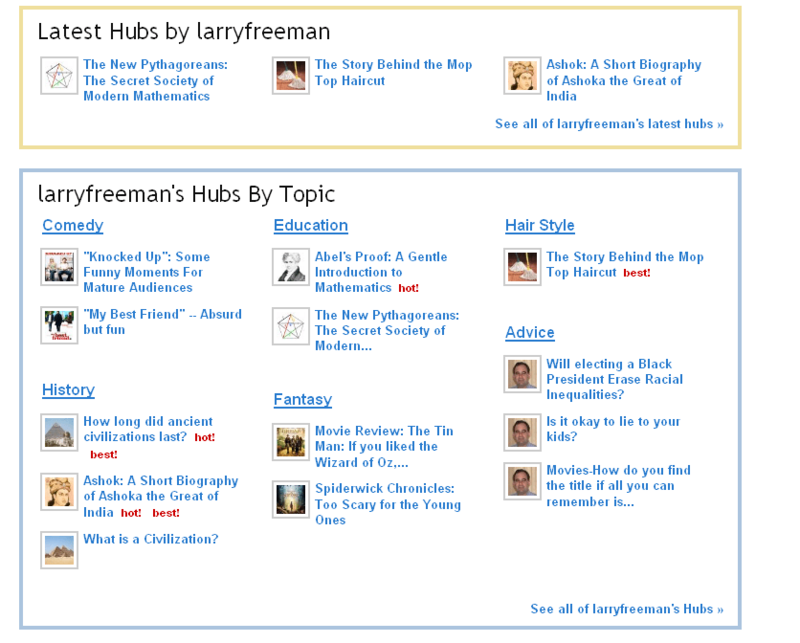 Hubs by Topic appears for every author who has published at least 15 hubs. The topics are chosen from the tags on an author’s hubs, giving authors yet another reason to choose good, relevant tags. Another notable addition to the profile page is the ability to search within an author’s hubs, which is something a number of people have asked for. That pretty much sums up what I have been doing for the last two months. 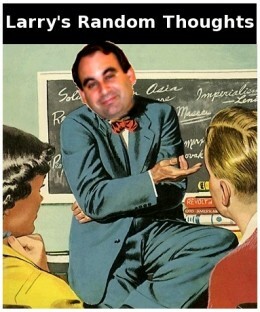 What do you think Paul, Larry, and I should work on next? As The Communicator of Awesomeness! I am always looking for ways to communicate the awesomeness of HubPages to any and everybody who I think could potentially play some part in the success and growth of what we’re doing. There are many different ways to tell someone about what HubPages actually is and what we do. Depending on who I’m talking to I sometimes need to make what I say a little more relevant to different so that they don’t just actually care about what I’m telling them, but they also get excited about it. Some people seem to get it fairly quickly when I tell them about HubPages and some people just simply don’t and I’m always trying to find way make the latter response appear fewer and fewer as time goes on. Now, one way to help some people better see what HubPages is all about it to physically show them one-on-one, which isn’t usually the most practical way to do it, but is very effective nonetheless. If we could somehow take that one-on-one experience that works so well and make it scale to a larger audience, all while still being effective, then we’d really have a winner. Well, thanks to my man Vincent ‘Vinnie’ Lauria, HubPages is going to be able to do just that next month on November 4th. Vinnie has given us the opportunity to demonstrate HubPages to many influential and up-and-coming Internet superstars by giving us a spot in his brainchild, The SiliconValley NewTech Meetup Group. I’m super excited to have the chance to show what we’re made of next month and I can’t wait to get everyone’s feedback. Now, let’s just hope that I don’t get stage fright. 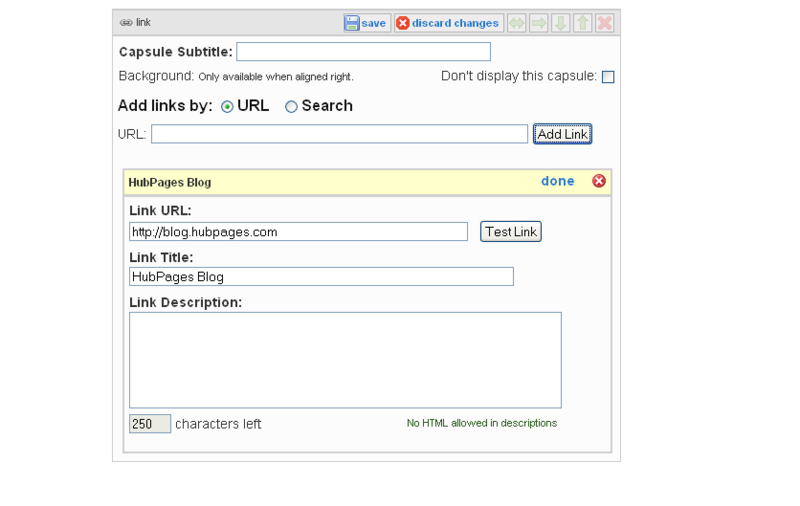 Just last night, HubPages released a bunch of new features. I am sure that everyone had already noticed the revised Profile page and the new Photo capsule. This is the great work of Fawntia Fowler and I will leave it to her to post the details on these new features. To add a Link Capsule to your hub, you start on the “EDIT” page of a hub. Then, in the top, right sidebar that says “Add More Stuff”, you select “links”. You will see a “Link” rectangle in the “Capsule Order” sidebar (below the “Edit Tags” sidebar) . 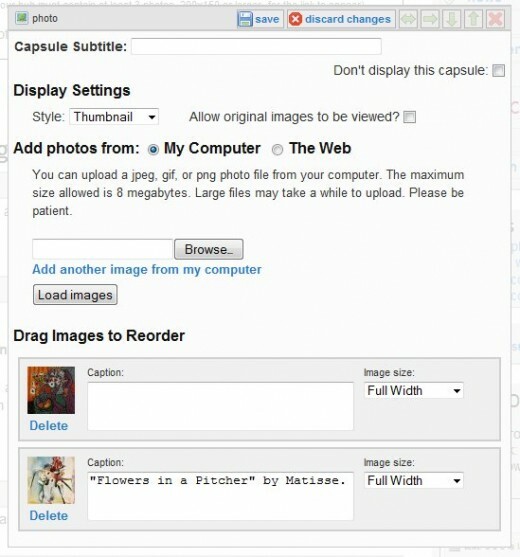 Now, you can move it around as you would any of the other capsules (“Text Capsule”, “Photo Capsule”, “Comments Capsule”). Instead of tabs, we now have two check boxes that you can choose from. 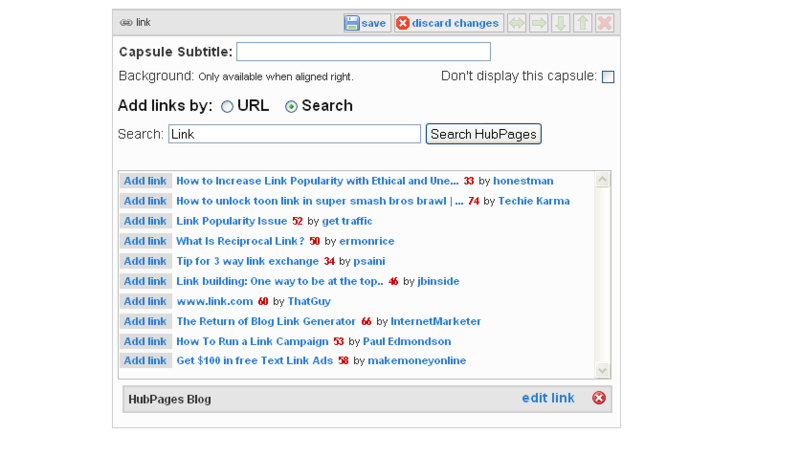 Either you add URLs directly or you can search for your favorite hub pages. Now, I enter the Link Description that I want to be included with the link. When you are done editing, you can hit the “done” link. You will see an “Add link” button, the title of the hub, the hub score (in red), and the author. To read a description of the hub, just put the mouse over the text of the title. A tool tip will pop up with the description of the hub. To add the Hub, just click the “Add link” button. In my case, I selected Paul Edmondson’s “How To Run a Link Campaign.” I now get an editable box that opens up. I can proceed in this way to add as the number of links that I want. I can now Drag and Drop the links in any order I want. I hope that you enjoy the new link capsule. Please keep your feedback coming!